This is my short story that was shortlisted in the Henley Literary Festival 2015 short-story competition. A few of you have asked me to post it on the blog so here it is! It is 3,000 words long so you may want to make yourself a cup of tea first. It was inspired by a true story. A spray of white blooms caught Connie’s eye as she marched past the flower stall, but she didn’t allow herself to falter. Not today. She had a very important meeting to make and she couldn’t be late. Possibly the most important meeting of her life… no, that was an exaggeration! Nonetheless, her mission was to reach the café at Selfridges before eleven o’clock. All her instincts told her that she should be safely in situ before her foe arrived. Stepping into the gutter to avoid a ponderous group of tourists, she picked up her pace and continued down Oxford Street. By the time Connie had bustled past the cosmetics counters on her way down to the basement, she was slightly out of breath. As she pressed her hand against her heaving chest, she congratulated herself on opting for sensible flats over her more adventurous pixie boots. A woman of her age and condition was required to choose comfort over glamour; she knew that now. However, a ghost of smile twisted her lips as she glanced down at her practical shoes. Her young friends told her they were still cool, though she struggled to see the beauty in Velcro straps. Fanning herself with one hand, she sat down on the café chair with a little pouf of exhaled breath and loosened the scarf tied around her head. It was a trifle humid in the café down here. Had she been right to choose this floor for their rendezvous? With her eyes trained anxiously on the escalator, she monitored the assortment of women who glided down it. She tried to imagine her sister Jill with wrinkles and a few spare tyres around her middle, significantly older, anyway, than the last time they had met all those years ago at the train station in Henley. It was a shock, therefore, when a young man approached her table and stood right in front of her, blocking her view of the escalator. For a moment, she bobbed her head around to the side, irritated that he had interrupted her careful surveillance. “Are you Connie?” the man asked hesitantly. He appeared to have a newspaper clipping in his hand, which his eyes kept straying to intermittently. “What’s it to you?” she replied, a little more aggressively than she intended. “How convenient,” Connie said, her voice laced with sarcasm to hide the crashing disappointment in her belly. She indicated the seat with dismissive flick of her hand. So this was Jill’s beloved boy. Screwing up her forehead, she examined his face. It was bland and slightly doughy in texture. There was nothing much there to draw her painter’s eye. Only his hair – black and luxurious, almost like horsehair – earned a second glance. Under her obvious scrutiny, his fleshy cheeks coloured up. “Mum warned me that you don’t take any prisoners,” he said with a nervous laugh. He stopped abruptly and looked apologetically across at Connie. There was a tense silence that ate up the air between them, before Connie finally brushed her hand over her face in a gesture of defeat. “Not yet,” he told her eagerly, “but I am engaged. She’s called Sarah. We are getting married in the summer.” He paused, painfully aware that Connie would not be invited to the wedding. “By the way, was it true that you flew a Lancaster bomber during the war?” he asked abruptly, his eyes lighting up with boyish excitement. “And how is your work?” he asked dutifully. But he never got his answer as a waitress came over to take their order. Afterwards they talked about his mother’s health problems. Connie proved a patient listener even if she didn’t exhibit much sympathy. Her expression remained neutral, pinched at times, but her dark eyes were quick and curious, flashes of vitality in an otherwise blank canvas. Little did Peter know that Connie’s facial control resulted from years of self-discipline. She had learnt the hard way to conceal her feelings, her wonts and desires, but despite all this training her eyes still gave her away on occasion. Finally, when they had exhausted Jill’s ailments, Connie took a sip of her tea and slowly unravelled her Chelsea bun. It was if they had called half time. Peter followed suit by lifting his coffee cup to his lips and gulping down some of the frothy milk. When he replaced the cup in its saucer, a white residue of milk remained on his top lip. Connie considered pointing this out but decided she had done enough to discompose her nephew. Connie faced an internal struggle. She had known when her mother died because one of her mother’s friends had written to her a month afterwards, but she still wanted to exact her revenge on Jill, or at least Jill’s proxy, this helpless boy-man. Why had Jill been so weak that she couldn’t defy their mother’s wishes, even from beyond the grave? The words came floating back to Connie across the chasm of half a century. You are dead to me! I can never forgive you for what you have done. She gripped her teacup, causing the sinews in her hand to stripe her skin, coarsened from so much exposure to white spirit. Her mother’s words still had the power to wound her, even in this busy, metropolitan café. Connie shuddered and looked back across at Peter who was now fiddling with the newspaper clipping he had brought with him. When he smoothed it out on the table, she saw that it was an article about her latest exhibition, topped with a large black and white photograph of herself. Peter threw his napkin over the spillage. “Doesn’t matter. It’ll all come out in the wash,” he said soothingly. “Apart from the scrapbook,” he repeated with an apologetic smile. On her walk back to the tube station, Connie stopped off at the flower stall. 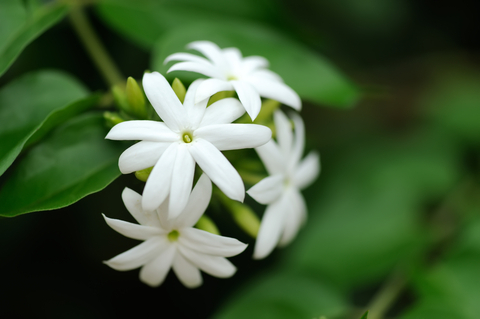 There were three pots of jasmine, each plant carefully draped around a wire arch secured in the soil. She bent forward to pick up the nearest pot and the sweet, cloying scent floated up into her nostrils. Usually she went out of her way to avoid the smell, finding it repugnant, but today she inhaled deeply, letting it spiral down into her very core. She wanted to unlock the memory of that night long ago lying under a moonlit sky in the garden at home, just hours before her mother disowned her. Connie met Isobel at a dance in the town hall. It was a wonder they had never crossed paths before, growing up in the same small town. Sometimes, when there weren’t enough boys to partner all the girls, they were forced to dance with each other. Connie always took the lead as Isobel preferred to assume the lady’s part. Afterwards, when they paused for a breather, Issy joked about how she preferred dancing with Connie because it meant that her toes never got trampled. Later on, they used to delay their arrival at the town hall in the hope that all the boys would be otherwise employed. Even now in old age, Connie could still remember the neat curve of Isobel’s waist beneath her hand as she guided her around the floor. They said things to each other through dance that they would never have dared to say aloud. Once, when a silky curl worked itself loose from Isobel’s elaborate hairdo, Connie smoothed it away and tucked it gently behind her ear. At home, during long, tedious afternoons, Connie would feverishly sketch Issy’s sweet face on the back of whatever came to hand – shopping lists, cigarette packets, or the blank page of a novel. One Saturday, after the band had packed it in for the night, instead of saying goodnight on the steps of the town hall, Isobel asked if she could come and see where Connie lived. She knew of course that Connie had grown up in the vicarage at the far end of town and she professed herself curious to see the beautiful old house under the full moon. Connie didn’t need to be asked twice. Although they chatted gaily all the way back to the house, there was a nervous tension between them that neither was prepared to acknowledge. When they reached the front gate, Connie took hold of Isobel’s hand – it felt such a natural thing to do – and led her around to the garden at the back. Feeling like an old-fashioned gallant, she whipped off her own cardigan and invited Isobel to sit down on the damp grass besides her mother’s jasmine plants that coiled up around a pergola. They pressed their hands to their mouths to stifle their giggles. To begin with, they amused themselves by adorning each other’s hair with the star-shaped flowers plucked from the bush by their side. It wasn’t clear who made the first move, but somehow this game ended with a kiss. Although Connie’s memory of that fateful night had softened and blurred over the years, she could still remember the pumping of her heart as their lips met. If she had been standing up, she felt sure her knees would have buckled underneath her. Instinctively she rolled her body on top of Isobel’s, pressing her weight down on those voluptuous breasts that had haunted her dreams for so long. The night air was laden with the aroma of jasmine and her recollection of their encounter would be forever associated with its sensual, animal scent. The last thing Connie remembered before the commotion was running her hand down the contours of Isobel’s flank. After that there was a powerful light shining in their eyes, a great deal of shouting, hands tearing them apart and a look of abject horror on her father’s leathery face. Isobel ran from the garden, crying and scattering flowers in her wake. Her father frogmarched Connie back up the garden – as they approached the house she glimpsed a pale face at the upstairs window. In the morning, Connie received her sentence. Her mother and father produced further evidence of her depravity – the febrile sketches of Isobel, some of them showing her half-naked with her dress slipping down over one shoulder. They both refused to meet her eye, but it was her mother who asked her to go upstairs and pack a suitcase. Initially, Connie failed to follow her meaning. With tears streaking down her cheeks, she stared blankly at her mother’s cold expression, struggling to process the enormity of the situation. She didn’t have to wait long for clarification. At the train station, Connie was scarcely aware of her surroundings. Still in shock, she sat on the empty platform with a battered suitcase at her feet and an envelope of money in her coat pocket, pressed upon her by her father as she left the house. She had no idea where to go or what to do once she reached London. As she got to her feet to board the train, she heard someone shouting her name. It was Jill. She turned wearily to face her younger sister. Connie nodded, too afraid to speak in case she started to cry again. From further up the platform, the guard blew his whistle. Jill helped Connie heave the suitcase onto the train. A translucent trail of snot snaked out of Jill’s nose but she was too distracted to wipe it away. She stood there on the platform, her hands limp by her side, as the engine roared into life and started to shunt its carriages out of the station. The year was 1938 and Connie was nineteen years old. Though she received the odd letter from Jill over the years, she never saw her sister or her parents again. After Jill left home to get married, she refused to furnish Connie with her new address. One of Britain’s foremost artists, Constance Barlow, died yesterday, aged 61, after a long battle with cancer. The reclusive painter, who abandoned her kitchen sink realism for a more abstract style late on in her career, came to prominence after the second-world war. She was close friends with the late Francis Bacon and was said to have been devastated when he died of cardiac arrest in 1992. Critics have noted that Miss Barlow’s mature work was heavily influenced by Bacon’s emotionally charged style of painting. Miss Barlow was born in Henley-on-Thames, Oxfordshire, but left home at nineteen to find work in London. During the war, she joined the Air Transport Auxiliary and learned to fly Lancaster bombers, a feat that has only burnished her reputation. Though she showed early promise as a painter, her work was not widely known until the 1960s, when she become famous for a series of paintings entitled Jasmine Under Moonlight, often featuring the elusive face of a young woman in the background. Her talent was all the more remarkable because she was largely self-taught. The funeral, to be held next week, will be attended by many luminaries from the art world, including the recent Turner nominee, Cat Loveday. “She lived quietly but will be sorely missed by her many friends,” said Joseph Templeton, the businessman and art collector, who bought several of her later works. Miss Barlow famously spent most of her life estranged from her family, but has surprised many in her inner circle by leaving the bulk of her estate to her sister Jill, a divorcée from Chorleywood. She leaves behind an impressive collection of modern art, a mews house in Belsize Park and a home in St Ives, Cornwall, where she kept up a studio for many years. See Page 9 for Constance Barlow’s obituary. A woman’s hand casts a shadow across the newspaper as she carefully cuts down the margin of the lead article. With her tongue protruding slightly from her mouth, she smears the back of the clipping with a thin layer of glue and presses it down onto the page of a large scrapbook. After blowing her nose, she closes the dog-eared scrapbook and replaces it in a cardboard box under her bed. To join the discussion on Facebook, click here. This short story was entered for the 2015 Henley Literary Festival Short Story Competition, sponsored by Dragonfly Tea. It was one of six finalists in a competition with more than 1,000 entries. Click here to listen to my interview on BBC Radio Berkshire (I come in at 1.49.37 on the timecode).